The Capitol was built on a site known at the "Mather Block". This was the highest point of ground within the city limits of Springfield and it was covered with a magnificent stand of trees. It is for these reasons that 3 years before ground was broken for the Capitol in 1868, many in the city wished to use the site for the burial place of Abraham Lincoln. Mrs. Lincoln, who preferred that the President be interred at Oak Ridge Cemetery, overruled these plans. She was said to have been favorably impressed when she and Mr. Lincoln attended the dedication of Oak Ridge on May 24, 1860. The following paragraphs and image are taken from: Abraham Lincoln, His Great Funeral Cortege, from Washington City to Springfield, Illinois. With a History and Description of the National Lincoln Monument, authored by John Carroll Power in 1872. It will be remembered that, on the twenty-fourth day of April, a public meeting was held in Springfield, at which a committee was chosen to make arrangements for sepulture of the remains of President Lincoln. It will also be borne in mind that the committee resolved itself into a National Lincoln Monument Association. A conditional contract had been made for a plat of ground on which to erect a monument, and the work of constructing a temporary vault, at the expense of the city, had been commenced. It was designed to be a resting place for the remains until the monument could be erected. By men working night and day, through sunshine and rain, it was ready for use at the appointed time, although the work was not quite completed on the outside. It was ascertained, on the morning of the fourth, that Mrs. Lincoln objected to the body of her husband being placed, even temporarily, in the new vault, on account of the grounds selected. She having expressed her preference for Oak Ridge Cemetery, it was in compliance with her wishes that the remains were taken there and deposited in the public receiving vault of the cemetery. The new vault was on the grounds that have since been purchased and donated by the city of Springfield to the State of Illinois, upon which the State is now erecting a Capitol, at an expense of three and a half million dollars. The vault stood about fifty yards north of the new State House. A cenotaph should, and doubtless will, be erected on the spot, after the edifice is completed and the grounds put in proper order. Figure No. 1 was engraved from a drawing of the vault, preserved by T.J. Dennis, who at the time was Mayor of the city. Projecting into the trench pictured may be seen the walls of the vault which had been prepared in 1865 to receive the remains of Abraham Lincoln. The distance between the walls, indicated by the arrows, is eight feet. 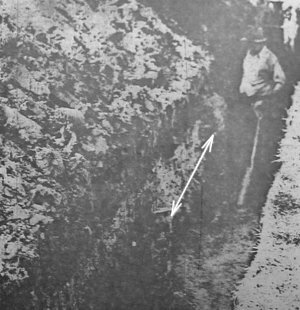 The man with the shovel is Robert Pedigo of this city, an employee of the John Doyle company, Jacksonville, contractors, who dug through the vault while excavating for a conduit from the power house to the capitol. This photograph and caption appeared in the August 2, 1930 edition of the Illinois State Journal. Plans for Illinois' sixth Capitol submitted by the Chicago-based architectural firm of Cochrane and Garnsey were approved by the General Assembly. Although J. C. Cochrane took the credit, most of the work had actually been drafted by his associates George Garnsey and Alfred Piquenard. 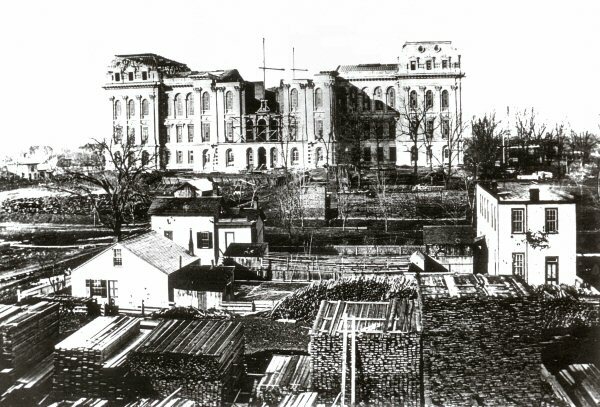 Ground was broken for the present Capitol on March 11, 1868; the first stone was set in place a few months later. 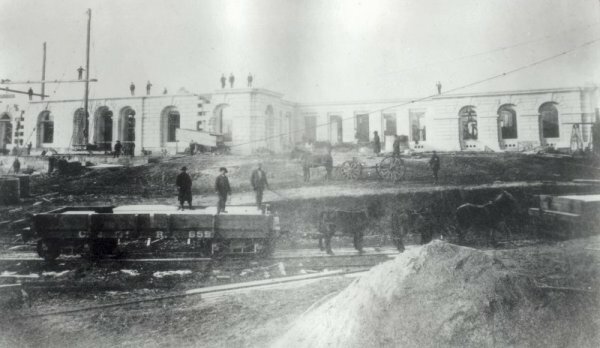 A railroad spur was run from the Toledo, Wabash, and Western Railway near 10th St, down Market (Capital) Street and circling the Capitol grounds. This made it easier to deliver heavy construction materials to the site. 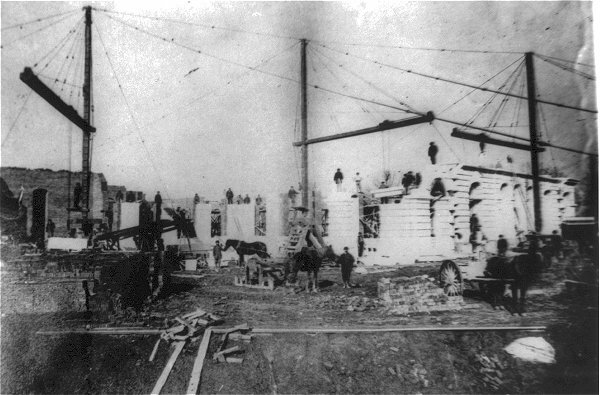 Wooden derricks were used to lift heavy limestone blocks to all areas of the building. Yesterday afternoon about three o'clock, quite a concourse of people assembled at the State House site, to witness operation of breaking ground preparatory to excavating trenches for the foundation of the new State House. At the hour mentioned above, J. Bunn, Esq., chairman of the Board of State House Commissioners, took hold of the plow, and turned a furrow on the line of the foundation for about half the distance. Hon. J. W. Smith then took the plow and completed the circuit. The two commissioners then took a spade and removed a small quantity of earth, and the work was turned over to the contractors. No speeches were made on the occasion and the whole operation was performed in a sensible and business-like manner. Should the weather permit, a large force will commence the work of excavating today. 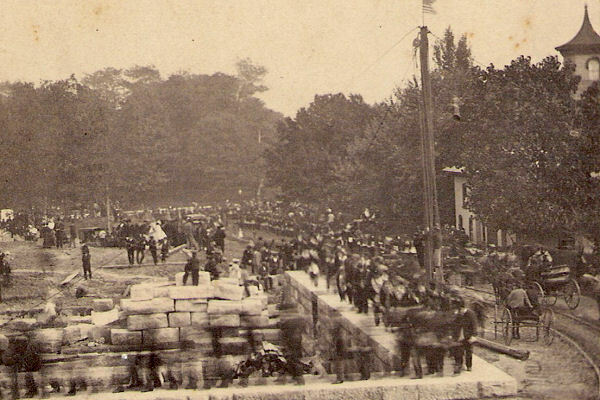 The formal laying of the cornerstone occurred on October 5th, 1868. Two years later the cornerstone developed large cracks and had to be replaced. Click here to read more about the cornerstones and their interesting history. 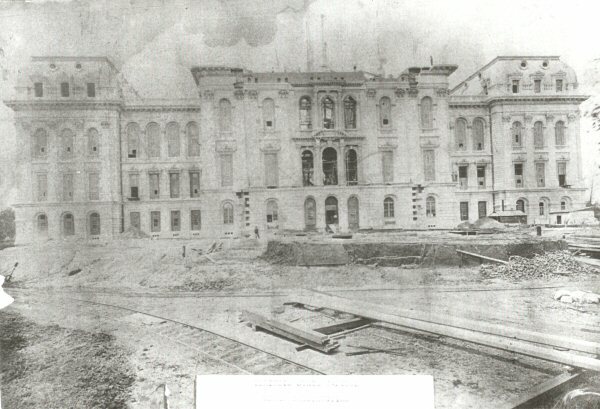 Although still unfinished after eight years of work, the General Assembly moved into the building in 1876. The project was continually plagued with trouble. Corruption was suspected several times and at least one workman was killed on the job. Construction continued intermittently for twenty years. During this time there was a serious movement afoot calling for the abandonment of the unfinished structure and the Capital's removal to some other Illinois city. Civil War veteran Richard J. Oglesby was Governor when the building was started and was serving a third term when the Capitol was finally completed two decades later in 1888. Initially, construction costs were limited by appropriation to $3,000,000, but expenditures had risen to over $4,500,000 at the time of completion. The Capitol, situated on a nine acre plot, was designed in the form of a modified Latin cross. The facade is classical, an extremely popular style for government and public buildings in the nineteenth century. The French-style Mansard roofs on the north and south wings are indicative of the influence of Piquenard, a native of France. The immense dome is supported by a circular foundation, 92-1/2 feet in diameter, set on solid rock 25-1/2 feet below the grade line. The walls supporting the dome, made from limestone quarried at Hancock County, are seventeen feet thick from the foundation to the first floor. Limestone from Joliet and Lemont quarries was used in the construction of the Capitol's exterior walls. The extreme length of the building from north to south is 379 feet, and 268 feet from east to west. The height from the ground line to the top of the dome is 361 feet, and 405 feet to the tip of the flagstaff. The red lights on the dome, electronically geared to turn on when visibility reaches a certain low, were installed as a guidance for pilots. When the Statehouse was constructed in the late 19th century there were three openings or shafts left in the rotunda, presumably for future elevators. The first elevator, a passenger model, was approved by joint resolution of the legislature. It lasted five years and was then replaced. This elevator was located in the southwest corner of the rotunda and was known as the Starkey R. Powell. (The State Journal-Register, October 31, 1974) It was torn out and subsequently replaced with a freight elevator. A contract was also let to Ellithorpe Air Brake Co. of Chicago in 1885. According to the SJ-R article, the contract called for two elevators at a cost of $8,500 and they included mirrors and seats. These elevators also included air brakes and air cushions. The Ellithorpe elevators were documented in The State Journal on January 8, 1887. According to newspaper accounts there was no documentation of elevators again until 1939 when the State appropriated $30,000 for repairing four passenger elevators. No one knows when the other two elevators were added to the building. Today there are three elevators located in the rotunda, two located in the North wing or Senate end of the building (which go from the basement to the sixth floor, two located in the south wing or House end of the building (which go from the basement to the sixth floor, one in the House wing (which travels from the third floor to the six floor), and two smaller elevators (one in each of the House and Senate wings) that travel from the first floor to the first floor mezzanine.